This vegan cake is super delicious and so easy to make that even beginners can make it without any struggle. A must try vegan recipe. In a bowl mix milk and apple cider vinegar, keep aside and allow the milk to curdle. Once the milk gets curdled add in the oil. Now add the wet ingredients and manually mix the ingredients together. Finally, add the chopped walnuts and grated carrot to the batter and gently fold them in the batter with the help of a spatula. Grease a cake pan and pour the batter into it. Bake in a pre-heated oven at 180 C / 350F for 40-45 minutes or until the inserted toothpick comes out clear. Take out the cake on a cooling rack and let it reach room temperature. In the meanwhile for preparing cream cheese frosting. Place the vegan cream cheese in a bowl and add icing sugar to it. Beat it with an electric beater for a few seconds. Don’t over beat otherwise the frosting will become very thin and runny. 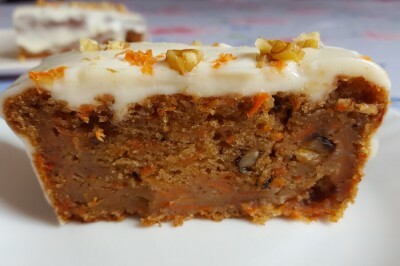 Nicely spread the cream cheese frosting on the cake and garnish with chopped walnuts and grated carrots. Let the frosting set on the cake and then cut the slices of your tasty vegan carrot cake. This recipe is soooo delicious. Only problem is I can’t stop eating it!